JT’s Books for Tablets campaign has ended for the year. Primary school pupils have made a huge effort, collecting over 8,000 telephone directories to be recycled and receiving over 50 tablets in return. A total of 25 local Primary schools took part in this year’s campaign, which aims to reduce waste. Whilst also teaching children about the importance of recycling. For every 150 directories a school collects, JT donated a tablet. These are pupil-friendly, touch-screen devices. And they provide internet access and education apps in a safe and secure environment. St Peter’s Primary School were top of the leader board, collecting 1,425 directories. Thus they will receive nine new tablets from JT. St Lawrence Primary School were second, collecting 680 books. This resulted in four tablets. 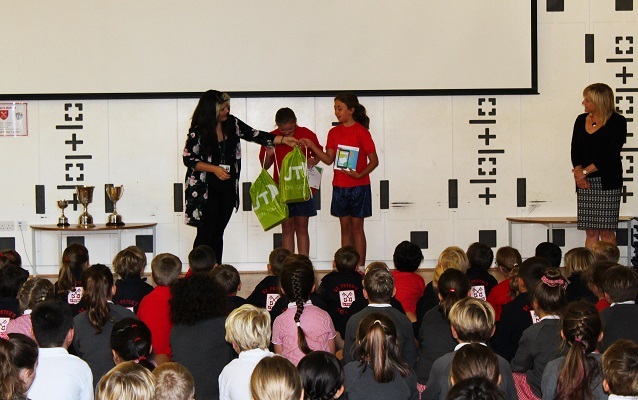 St Christopher’s Preparatory School were third, collecting 608 directories and also receiving four tablets in return. Photograph: Tablets being donated to St Peter’s primary school during assembly.